As the most popular transportation method for powder materials all over the word,pneumatic conveying is more efficient,but the wear and abrasion problems normally occur in the pipebends and valves,where the conveyed material is subjuet to a high degree of turbulence,and system's efficient will be reduced. When alumina and zirconia ceramics are used in pipes,bends and valves,things get better,FUVALVE ceramic ball valves have a unique structure with ceramics lines the flow path,which ensure wear and abrasion are avoided significantly.Generally,the serice life of fully lined ceramic ball valve used in powder pneumatic conveying is about 3times longer than other valves. (1)This is a typical system,and others are also applicable. 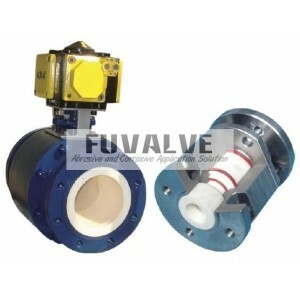 (2)FUVALVE Ceramic semi-ball valve will be a good choice as a feeding valve.